The police killing of Mitch Henriquez has led to three nights of protest and sometimes surprisingly serious anti-police resistance in the Schilderswijk neighbourhood, in the Dutch city The Hague. It is a neighbourhood where the majority of the people living there is of migrant background. Serveral hundreds of youn people confronted the cops for hours on Monday night and again on Wednesday night. But streets in the neighbourhood were not exacty quiet on Tuesday night either. The immediate cause of the anger was the death of Mitch Hernandez, an Arubian man who was in The Hague to visit family. He was on a festival, basicaly having fun. Police overheard him claiming he had a gun, jumped upon him and held him violently to the ground till he did not move anymore. Then they thrwe him in a police van and brought him to a police station. Only then they 'discovered”that something was very wrong with him. The next day, Mitch died. The claim of the public prosecution's office that he only went sick while he already was in the police car was untrue, as the prosecution itself had to admit after videos came out showing that Mitch was claarly in a very bad shape during the arrest itsel, before he was even pushed into the police vehicle. The claim that Mitch had said that he was armed – the justification for his violent arrest – is disputed by at least one witness of the events. Basically, Mitch was choked to death by five police agents holding him down. On Wednesday the public prosecution 's office admitted that the 'probably cause' of his death was lack of oxygene caused by the police handling of him. They are on leave, but not arrested. In th The Hague, you get killed when cops say you may have a gun. In The Hague you walk free, even if you are a murder suspect, as long as you are a police officer on duty when that crime was committed. Ofcourse, people thought of Ferguson and Baltimore. The police violence of which Mitch was a victim has a clear racist dimension. Mitch was from Aruba, one of the remnants of the Dutch colonial empire, formerly part of the Dutch Antilles in the Carribbean. Antillians and Arubians form sizable communities in the Netherlands. They are generally very poor, and suffer from racist treatment by police, and racist abuse by politicians. When rightwingers get bored with blaming Muslims for all imaginable ills, they switch to targeting Astillians/ Arubians, and back again. So when an Arubian man got killed by cops, people made connections. Nobody in her of his right mind believs that an white man wouldd have been trteated as Mitch has been treated. The fact that politicians on Aruba immediately raised their voice helped to gwenerate publicity. Family members and activists started te spread the news and asking critical questions. The Hague police could not push the killing under the carpet. This was, after all, not the first time. People remember the killing of seventeen year old Rishi, a person of colpur as well, by police bullets in December 2012. The killer cop went free. Monday evening saw the first demonstration in protest against Mitch' killings. Hundreds of people assembled near the police station in the Schiklderswijk neighbourhood. They demanded an explanation of the police, and when that was not immediately forthcoming, a sizable part ofthe crowd tried to storm the building. Riot cops charged and began chasing away the crowds, who resisted and fought back with stones and fireworks. Groups of people spread through neighbouring areas, there was a bit of property destruction and fire. Of course, the day after we heard the usual complaints about 'riots' from politicians, from the mayor – whose dismissal is one of the demands of the protests – upwards. Much was made of the fact that Mitch' family distanced itself from the 'violence' that people living in the neighbourhood complained about it, that a mosque called young muslims toekeep quiet, that local entrepeneurs – who suffered some dagage – opposed the 'rioteers'. This is to be expected: the somewhat more established, somewhat less-impoverished, parts of the communities clash with the poor, desperate, young and very angry members of the impoverished strata of the communities. This is an anti-police thing., with demands like an independent investigation, dismissal of the mayor and the openly racist police commissar, Paul van Musschert. This is at the same time a class struggle thing, in which the resisters clash with the more bourgeois parts of the community, even in sometimes inarticulate ways. The next night, there was no organizerd call-out for action. Yet, two hundred people hung around on the streats, eager to continue some sort of a fight. There was small-scale rioting, if one wants to call it that, with a bit of fire and property destruction as well. Nothing compared with what went before, and nothing especially comared with what was to come. During the day, a Facebook-call-out for a new demonstration started to circulate It did not go viral, it spread much less than a similar call-our for Monday's action. I have heard it said th that people who participated ion Monday, now refused because of the violence intio which the protest erupted. So, lots of people now abstained. I do not know how widespread this is, but it certainly played a role. So the call-out got only meagre support, and at first, it looked like the protest itself was small-scale. Forces were at work to make it more insistent and more uncontrollable than the two earlier nights. The biggest force in that direction was the police itself, with their arrogance. After all, people protested litterally against their colleagues. So showing off their power which was the reason of the revolt in the first place may not have been the wisest thibngg to do, tactically speaking. But showing off their power is what they did, and the reaction was not ,.long in coming. Riot cops turned out in serious numbers, with everything ready. 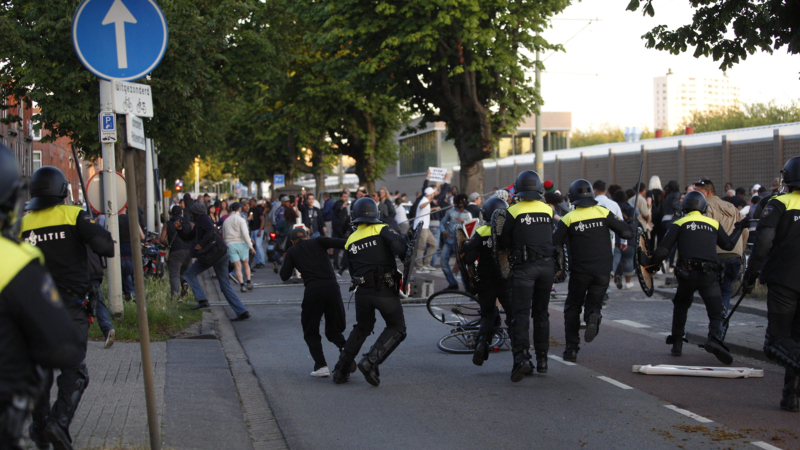 When about two hundred protesters assembled arount the Schilderswijk police station - focus of the action Monday, and hated headquarter of police repression for much longer – police told them to go to the Malieveld! Now, the Malieveld is a big field of grass just outside the city center. It is a nice place to assemble for a demonstration of many thousands. It is a horrible location for smaller demonstrations, it is a place to get miserably lost if you are a few hundred: nobody sees or hears you. Which was exactly the point. 'You may only protest on the Malieveld' is the sophisticated Dutch way of saying: 'you may not seriously protest'. But seriously protesting is exactly what people were very determined to do. They did not go out on the hot summer evening to obey meekly. Protesters refused to leave, and almost immediately, police lines started to push people away, in an gradually escalating fashion, up to full-scale charges. People resisted, riot cops formed lines, people ignited fireworks and threw stones. Police chased demonstrators from one street, crowds assembled somewhere else. A long night of revolt had started, with several hundreds of young people playing what reporters called a “cat and mouse game” with the cops. At one place, people threw stones on police officers from up in a housing block. At another place, crowds attacked a line of riot cops from both sides, making the cops seek shelter in their vans! Of course, they counterattacked soon thereafter.. Police on horse, police vans, jeeps, cops without uniform but with clubs, and a water cannon, all were used to regain control the Schilderwijk streets. About 4 hours after midnight, some semblance of law and order was finally restored with numerous arrests and wild police charges. . This was not just a few nights of riots. This was – or is? – an anti-police uprising by hundreds of young people of a very diverse background. One of the demonstrators sums up the essence of the events: “Tonight, everybody has the same purpose. There are Dutch here, Turks, Moroccans, and Arubians. It makes no difference. If the police touches one of us, they touch all of us.” That were the words of a so-called 'rioteer' on Monday night, quopted on a big commercial broadcasting station. The title of the article summed up his attitude: the police deserved this. Yes, there are uglier sides tio the events. I do not mean the destruction and the fires, and the minor looting ( rather extraordinary , by the weay, in the Dutch context): these things are just part of the whole process. Yes, a piano was turned upside down in a theatre that was attacked by rowdy people. Tough luck. A man got killed, so people are angry and find ways to express their rage. But some of the shouting of angry youth turned ugly, if reports are to be believed. I have read several reports that mentioned the shouting of anti-Jewish slogans. Translated in mainstream press language: “Outside, people shouted against Jews”. I doubt that this is accurate: anti-Jewish language directed at a vandalized building – this was near the theatre with the damaged piano – is not quite the same as 'shouting against Jews' as such. The anger is mainly directed against the police, with some people possibly using detestable antisemitic language in their very justified anger. That language is unhealthy: it does not threaten the cops, but it does give members of Jewish communites a very uneasy feeling. It should be opposed where it occurs. Sadly, terms of abuse with antisemitic connotations are quite widespread; antisemitic slogans are often heard around soccer games. I think that the anti-Jewish shouting – if there has been any – has to be seen in that connection, But a warning is in order: a few lines in a few reports in the mainstream press should not count as evidence of antisemitism. Papers and newssites lie about these kind of things, and tarring demonstrators with the brush of antisemitism is part of the right wing repertoire of demagoguery. That, however, all kind of ugly sentiments get expressed when crowds of people without any specifi political orientetion begin to express their rage, is to be expected, it is part of how these kind s of resistance explode and arise. What is going to happen next? Yesterday, when the Facebook-call for the evening did not get much support, it looked like the movevement weas petering out. Today, I am not at all sure about that. Neither are the authorities, apparently. The prime minister has called for the riots to stop immediately. Authorities use quick-phase prosecution prosedures agains people arrested: 34 last night, 61 in total. A ban on assembling in groups his in effect in the Schilderswijk area, a measure that gives police extra powers to suppress resistance. The other side is worried. One can only hope that unruly angry crowds give them plenty of reasons to get even more worried than they already are. Much will depend on the resilience of the youthful crowds themselves. They have shown their defiance. Will they keep it up, and what can we all do to support? These are the questions anti-authoritarian revolutionaries are, or should be, asking themselves and each other. Anti-authorian revolutionaries,have a role to play: being on the streets side by side with all the other angry people, but also helping with arrestee support, spreading information about the revolt, defending it against both right wing attacks and against social democrat/ pacifist calls for 'moderation' and 'non-violence'. It is the militancy of the crowds that has brought the movement this far, encouragingly far. It is this militancy, combined with solidarity, that can bring the movement even farther still. There are worse ways to start a summer than with a few hot nights of barricades and struggle. Pictures, lots of pictures, can be found with many of the links I provided. Especially intriguing are photo series of a website that is apparently well-connected with the authorities, protecting the anonymity of riot cops by making them unrecognizable. Tonight, everybody has the same purpose. There are Dutch here, Turks, Moroccans, and Arubians. It makes no difference. If the police touches one of us, they touch all of us.